March 29, 2018, Reston, Virginia – Maryland & Virginia Milk Producers Cooperative congratulates Kettle Wind Farm of Nokesville, Virginia for 50 years of membership. 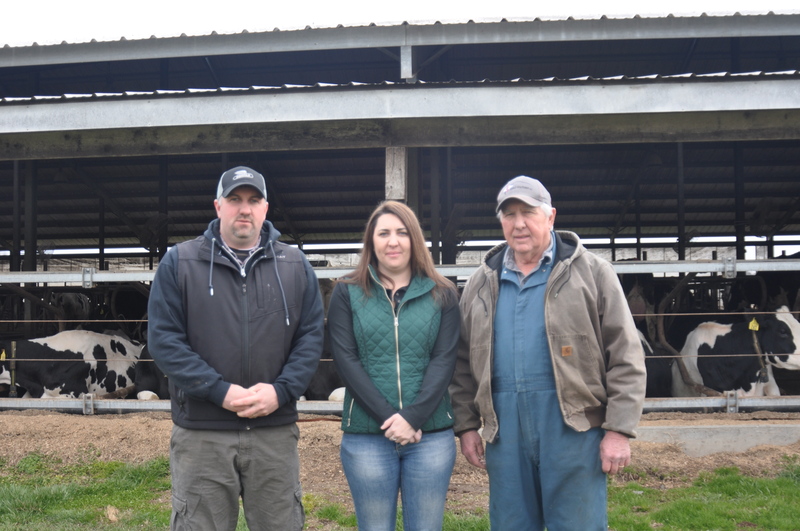 Paul House has been farming his whole life, and his grandfather, John House, was a charter member of Maryland & Virginia Milk Producers for another property, Dutchland Farms. His adult children, Kyle House and Stephanie Cornnell, help run the farm and business operations. Their mother, Flora passed away from cancer a few years ago but her presence on the farm remains. It was she who came up with the name for Kettle Wind Farm, putting together the location of the original farm property, adjacent Kettle Run, and the fact that there was always a little breeze blowing there. Kettle Wind Farms encompasses 4,000 total acres with the milking parlor positioned close to the road, and the barns and calf housing reaching back toward the fields. Cow comfort is a priority for Paul and Kyle, and looking at the cows resting on their new mattresses bedded with sawdust, it’s clear that the work has paid off. Kettle Wind has two farm locations with 300 milking and dry cows, largely Holsteins with a few Jerseys. Their calves are raised in a greenhouse setup and in hutches, and their heifers are raised at a nearby farm. Kyle notes that technology is key to helping them to stay on top of their herd and head off issues at the earliest opportunity; individual neck collars assess the health and condition of each cow throughout the day. Paul and his family have diversified Kettle Wind Farm over the last two decades. They operate two small sod companies and have invested in the specified equipment, and cutting as much as 12 acres per day. They remain very cognizant of their responsibility to the environment as farmers, and have been lauded for their conservation efforts. Kettle Wind also grows 2,000 acres of soybeans and 800 acres of corn, and 400 acres of wheat. You can learn more about our member farmers like the House family by visiting the Maryland & Virginia website at www.mdvamilk.com. Kettle Wind Farm: (L-R) Siblings Kyle House and Stephanie Cornnell and their father Paul House help run the farm and business operations of Kettle Wind Farm, LLC. The House family was the recipient of Maryland & Virginia Milk Producers 50-Year Member award.